I hate to say this to you, but if you haven't heard of this famous place that's renowned for their famous Nutella milkshakes with a Nutella-filled cronut on top, you've probably been living under a rock. Having bombarded several social media platforms since its opening earlier this year, Foodcraft Espresso & Bakery has certainly been on my 'milkshakes to try' list at a time that milkshakes are so hyped up and loved by Sydney. Located at the bottom floor of a newly built residential apartment, Foodcraft actually took my companion and I a while to find. We'd walked down Bridge St from Erskineville train station, and were immediately questioning Google Maps after seeing terraced houses or apartments in every direction before finally spotting this quirky cafe. With 3.8m high ceilings, thick brick walls and tall windows, Foodcraft was sure to create an upbeat yet relaxed vibe already upon initial steps inside. With all these, we were seated on tin chairs while viewing their completely opened kitchen. We were immediately served some water by a friendly waitress, despite the business at 11am on a Tuesday. I guess Foodcraft can attribute their success to the overwhelming publicity from all social media platforms. Mind you, the water will definitely be needed! We decided to start with some drinks, and a visit to Foodcraft would of course not be complete without ordering their famous Tela Ball milkshakes. To our surprise, there were a couple of Tela Ball and milkshake flavours to choose from. Why have we only seen the Nutella ones on social media, then? I had a 'World Famous Tela Ball Shake' in a vanilla flavoured shake and a custard-filled Tela Ball ($10). I loved how the custard would ooze out of the ball and amalgamate with the milkshake. The Tela Ball itself was also very yummy- not too dry, and not too sweet on its own. No wonder these Tela Balls were so famous! My friend had a 'Double Choc Milkshake' ($7) with a Nutella Tela Ball on top ($4.50) (Note: she ordered these two items separately, which meant that it came down to being more expensive than a 'World Famous Tela Ball Shake' because of her freedom to choose different combinations between the shake and the Tela Ball). She, on the other hand, wasn't devouring her food as much or as quickly as I was. She said that it was definitely really good and worthwhile to try, but there was just an overwhelming amount of sugar in it, both in the Tela Ball and in the Double Choc Milkshake. At this point, I was relieved I had serendipitously made a decision to not relish in my usual sweet-tooth. We'd also ordered some food to go with our shakes. I had an 'Eggs Benedict' ($16) - poached eggs with smoked Tasmanian salmon or organic ham on brioche. These eggs benedict can only be described as one of the best I've had, and that's not an exaggeration. This hearty dish was smothered with generous amounts of Hollandaise sauce that accompanied all other freshly produced components. I would've been happy to have this Hollandaise sauce with anything else, as it had the perfect consistency and balance between ingredients. The only 'downside' was that the serving was so big that I had to take breaks between each bite in order to finish it. 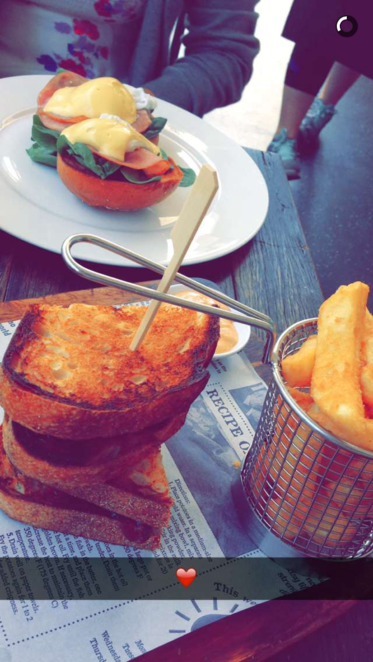 My friend ordered a 'Steak Sandwich' ($19) - grilled scotch fillet on organic sourdough, caramelised onions, provolone cheese, roma tomato, mixed leaf, with BBQ & aioli served with beer battered chips and house spicy mayo (Note: she ordered it without any of the vegetables). One of the owners of the restaurant came up to her and said that it was actually a smart idea to request to not have all of those ingredients, as the sandwich would've otherwise been quite difficult to hold due to its thickness. She mentioned that the steak sandwich was one of the best she's ever had, which shone through in her sincere effort to at least finish the steak pieces despite claiming how full she already was. It was a very substantial meal, she'd just struggled to finish it. Overall, Foodcraft definitely did not disappoint. We'd just wished that we were warned about the overly generous amounts of servings, both in their shakes and in their food. Looking around, it appeared that many people could not finish their food, nor their drinks. To be honest, we personally thought their foods were better than the overhyped drinks, but you can and should find that out for yourself. They definitely managed to make something unique with those milkshakes.